Right Click Disable ? How to enable It? Recently, I surfed a website that disabled the right click function of the mouse button and it is quite irritating and inconvenience. As a result, I had created a Allow Right Click Tab for my firefox browser (you may try other browsers). The method is pretty simple, follow this few steps. 1. 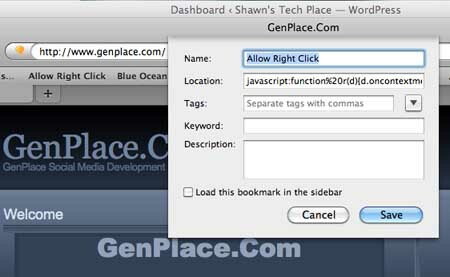 Create a Tap in the Bookmarks Toolbar as shown at top. Very good tip, I have the same problem when a website disabled the right click, annoying. Right click still doesn’t work on the site I want to use it on. More explanation needed. How do you use this, once you have made a new bookmark? Do I click the bookmark? Or do I Is it Mac only?